Hiroshima, Japan. August 6, 1945. 8:15 am. A bright flash lights up the sky. A fireball 300 metres wide burns with intense heat, 4000°C. Morning commuters disappear, vaporized or turned to carbon in an instant. A mushroom cloud floats up. A powerful shockwave flows over the city, destroying Hiroshima in stages. Buildings become shrapnel, blown apart by the blast. People are thrown across rooms, slammed into the ground, buried by rubble. A black belt of cloud appears, concealing the horrifying scene burning below. Rain begins to fall. Black rain. Thick, dark, poison drops from the sky, into the mouths of those desperate for a drink. The next day, rescue efforts begin. Survivors are taken for medical treatment. Corpses are gathered for cremation. Radiation sickness runs rampant. Necrosis claims its victims. Wreckage is cleared away. Rebuilding begins. A new city takes shape. Trees are planted. Grass is grown. A site of terror, now a place of beauty. Memorials are erected. Museums are built. All tell the story of that dark August day. This is the Hiroshima Peace Memorial Park. The Hiroshima Peace Memorial Park was built in the 1950’s to memorialize the first victims of a nuclear attack. The park covers an area which was close to the hypocenter of the blast. Once Hiroshima’s busiest commercial district, the area is now a beautiful park embraced by the Honkawa and Motoyasu rivers on either side. Sculpted trees, flower gardens and monuments have transformed a site of destruction into an attractive place to pay tribute to the victims and advocate for world peace. Every year on August 6, the Hiroshima Peace Memorial Ceremony is held in this park. We started our visit at the Atomic Bomb Dome, the Peace Memorial Park’s primary monument. While seeing the A-Bomb Dome can be a grim experience for many, the rest of the park is a beautiful space symbolizing everlasting peace and honouring the victims of the atomic bombing. There are a lot of different monuments in the park dedicated to different groups of victims. Here are just some of the main points of interest in the Hiroshima Peace Memorial Park. The Atomic Bomb Dome is a chilling reminder of the horrific destruction that took place on August 6, 1945. The former Industrial Promotion Hall still stands where the Motoyasu and Honkawa rivers merge, a shell of what it once was before the bombing. Its dome stripped down to the metal frame, the outer walls partially intact but heavily damaged, Promotion Hall looks almost exactly as it did after the bombing. The building was able to survive complete devastation because the bomb exploded almost directly overhead, 600 metres above the dome. The hall was the only structure left standing near the bomb’s hypocenter. The Atomic Bomb Dome’s association with a significant event in human history, led to it being registered as a UNESCO World Heritage Site in 1996. As we stood and stared at the Atomic Bomb Dome, the word that kept coming up in our conversations was “crazy”. It was absolutely crazy that something so horrific was allowed to happen. It was crazy that winning a war and experimenting with nuclear weapons took precedence over the value of human life. It was crazy that this building had been able to survive the destructive forces that demolished the city, turning everything within a two-mile radius to ash. And it was crazy to think that 70 years earlier the first atomic bomb used in warfare exploded almost directly above where we were standing. We were humbled, shocked, appalled and a little shaken up after seeing the Atomic Bomb Dome. While these are not necessarily emotions one wants to feel on vacation, they are the precise emotions I think I sight such as this should evoke. 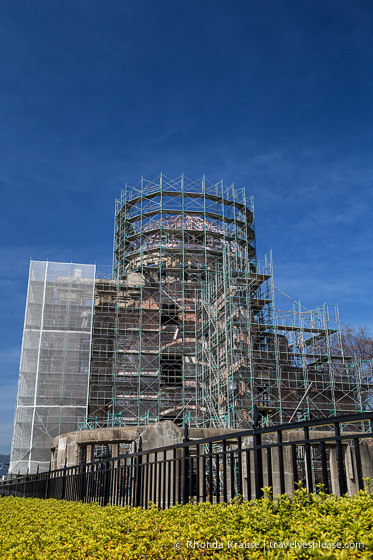 As you can see from my pictures, the Atomic Bomb Dome was covered in scaffolding during our visit. Every 3 years the city does a survey on the building to make sure that everything is preserved exactly as it was on the day the bomb was detonated. The Peace Bell is near the northern entrance to the park and visitors are encouraged to ring it as a message of peace. Not far from the Peace Bell is the Memorial Mound, which contains the ashes of tens of thousands of victims. As this spot is close to the hypocenter, it was where corpses were collected and then cremated. Continuing further into the park, we came to the Children’s Peace Monument. This monument is dedicated to all children who died as a result of the atomic bombing. The monument was inspired by the story of a young victim who believed that she would recover from her illness once she made 1,000 paper cranes. At the top of the monument is a statue of a young girl lifting a golden crane, the Japanese symbol of longevity and happiness. Although the young girl did not survive, her memory lives on in the many paper cranes, made by school children, which surround the memorial. Across the street from the Children’s Peace Monument is the Flame of Peace. As long as there are nuclear weapons on earth, this flame will continuously burn, as it has since 1964. It will be extinguished only when all nuclear weapons are eliminated and the planet is free from the threat of nuclear destruction. The cenotaph is truly the heart of Hiroshima’s Peace Memorial Park. Not only is it dedicated to all the victims of the bombing, but it embodies the hope that Hiroshima will forever stand as a symbol of peace. An English plaque was added to the memorial in 1983, clarifying the ambiguity of the epitaph. The “we” was intended to mean all humanity and “error” refers to the evils of war. The Peace Memorial Museum displays photos, videos and objects that show the devastation of the atomic bombing. We didn’t actually go inside the museum for a few reasons. One, we wanted to have enough time to visit Hiroshima Castle. Two, we were worried it would be too graphic and upsetting. There was a man at the Atomic Bomb Dome, a relative of one of the victims, who showed us some pictures of people years after the bombing. Seeing the effects of the radiation was very sad and disturbing. Not wanting to see any more graphic pictures, we decided to skip the museum, just in case. Not far from the museum you can see a tree that survived, and is continuing to thrive, after the atomic bombing. This tree was about 1,300 metres away from the hypocenter of the explosion. Half of its trunk was burnt to a hollow as a result. If you look closely, you can see the tree growing around where it was burned. The tree was transplanted in the Peace Memorial Park in 1973. Outside of the Hiroshima National Peace Memorial Hall, there is a large clock showing the time 8:15. This was the time that the A-bomb was dropped on Hiroshima. Surrounding the clock monument are fragments of roof tiles and other objects that were unearthed from the Memorial Hall. It’s hard to describe how we felt about our visit to the Hiroshima Peace Park. On the surface, it was an educational, eye opening experience. Going deeper though, the Peace Memorial Park evoked a lot of emotion. Some emotions, such as shock and sadness, I expected. Other emotions were much more surprising. I felt anger. I felt shame. I questioned how humankind could have let such a terrible event happen. How could hate and war be chosen over love and peace? I felt respect. I felt pride. The Peace Memorial Park provides victims a beautiful space to rest. Future generations were given a peaceful place to reflect. Mostly though, I felt hope. Hope that this park was not created in vain. Hope that the world will remember the atrocities of that day and choose to resolve conflict without the use of violence. Hope that we all look upon Hiroshima as a symbol of peace. Hope that one day, nuclear weapons will be abolished and the Flame of Peace will be extinguished. The Peace Memorial Park is located in central Hiroshima. A good place to start your visit is at the Atomic Bomb Dome, near Aioi-bashi Bridge. The Hiroshima Tourist Information Centre is located in the park and can be found in the Rest House. Both the bus and streetcar have stops near the park. If taking the streetcar, get off at Genbaku Dome stop. The Hiroshima Peace Memorial Museum is open 8:30 am- 6:00 pm from March- November. It’s open until 7:00 pm in August. From December- February hours are 8:30 am- 5:00 pm. Last admission is 30 minutes before closing. Frank - Nice post. ‘Crazy’ is the word that comes to mind for me as well. It is incredible the destructiveness that mankind can create when at war. It was a different time but history shows that these kind of atrocities happen time and time again and that we don’t learn from the past.